Summer is the time to get out into the water – water sports are a great way to get exercise and keep cool all at the same time, and to keep fit as a whole family. Swimming exercises more muscles than just about any other sport, and is suitable for all the family, from young to old (it’s especially good for people with any muscle or joint problems). Most towns have a local pool, and will have sessions that are open to the whole family, as well as lessons for the more reluctant (or more wary) swimmers, and the keen swimmers too. Sailing boats range from tiny one-seater dinghies for zipping around a lake to large ocean-going yachts that will fit the whole family. For the novice sailor, there are centres that offer taster days, and if it appeals, there are lots of sailing holidays that include training, and may even lead to a qualification. 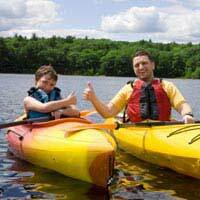 Canoes and kayaks (the names are sometimes used interchangeably) are small single or double seater boats. Kayaks are enclosed and have waterproof coverings (spray deck), and originated in the sub-Arctic, in Greenland, Northeast Asia and North America. Canoes originated in Europe, and may be enclosed or open. Canoes and kayaks are propelled using single or double bladed paddles, with the paddlers facing the direction of travel, and be hired on many rivers or lakes. Surfing seems to have originated in the Pacific islands like Tahiti, Tonga and Samoa. Surfing and bodyboarding both involve riding the waves on boards made from polystyrene or polyurethane or other types of foam, covered with fabric or fibreglass, but bodyboards are smaller. Bodyboarding is easier to learn than surfing, as the board is smaller and easier to move, and can be ridden lying down. Bodyboarders use swim fins (flippers) to propel their boards, and wetsuits can be a good idea as the sea is sometimes very cold. There are lessons for both bodyboarding and surfing available at many surfing beaches. Windsurfing is a board similar to a surfboard powered by the wind in a sail, and is fast – windsurfers can travel at up to 50 knots (about 58 miles an hour), so it isn’t for the fainthearted! Try it out at a taster session, or go on a holiday that includes lessons. It’s a good idea to be able to swim and be confident going underwater before sailing, canoeing or surfing. When sailing or canoeing, always wear a lifejacket, preferably a brightly coloured one. Watch out for cold deep water in lakes and reservoirs, and remember that reservoirs are storing water that will eventually be for drinking, so don’t use them for swimming, and make sure that boats or canoes are washed thoroughly beforehand. When surfing or bodyboarding, keep an eye out for warning flags and watch out for beaches that are for swimmers only. Remember to use plenty of waterproof sunscreen, even when the sun doesn’t seem very strong, as it will reflect up from the water, and tray to avoid swallowing water in rivers, lakes and the sea.